* FireAndFury.today has no inside knowledge. Danger rating is based simply on the whim of everyone else on the site. Don't like the danger rating? Have your say and vote today! ** Danger rating is calculated based on the votes of the previous 24 hours. 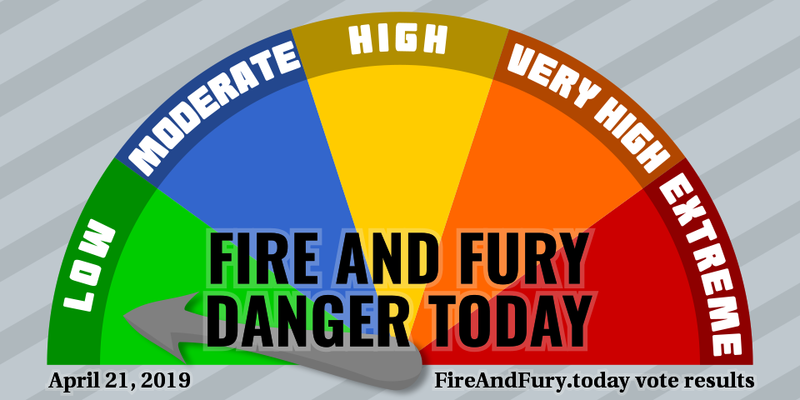 While FireAndFury.today was designed because of President Trump's comments about what North Korea would face if it attacked the United States or an ally, there are other things that could cause Fire and Fury. But probably not as likely.